Cals Refineries Ltd's (BSE: 526652) Annual General Meeting for 2011 is scheduled for September 27th, in the backdrop of a financial year (FY'10-11) in which the refinery project made some concrete advances after a lull of nearly two years, but which is still fully not out of the woods, pending a CCEA approval for a crucial capacity and equity expansion. StockExplain interacted with Cals Refineries' management several times over the past two weeks, to ascertain the correct status of the project, for the benefit of its investors, before going in for the AGM. Though Cals Refineries had published a reasonably detailed Annual Report for FY'11 recently, as a media covering the scrip in detail for some time now, StockExplain had found several details lacking. However, Cals Refineries management has now clarified many of our core doubts on the project status. Earlier, StockExplain had queried Cals on its Q1-FY'12 quarterly disclosures filed at BSE, and published our key assessments. Though this report from Cals came earlier than the Annual Report, investors should keep in mind that in correct chronological order, the quarterly disclosure is the latest document from the company. Nevertheless, the Annual Report (AR) contained much more interesting leads that StockExplain tried to explore in detail since then. Though the AR mentions several key developments and issues in FY'11 and even in FY'12 till date, including highlighted affairs like a further cash infusion into the equity by Hardt, as well as a couple of qualifications by the auditors, what comes across as most interesting is the current risk-profile of the project. It should be recalled that most of Cals Refineries' current equity, was funded by a GDR in December 2007 amounting to $200 million, which had brought in Rs. 788 crore in equity, at the then prevailing exchange rates. Subsequently, Cals had utilized this full amount, as well as some further equity too, towards setting up their refinery project. The bulk of this fund utilization was towards purchase of used refinery equipment from overseas and consultancy charges. To illustrate, at the close of FY'11, capital advances plus consultancy charges made up over Rs. 825 crore, against total equity of Rs. 827.56 crore (including share application money pending allotment of Rs. 14.68 crore) . In other words, the entire equity has been paid as advances and consultancy charges towards procurement of refinery equipment, in this project which is yet to tie-up any significant debt. Other pre-operative expenses were being met by small secured and unsecured loans from promoters and outside sources. The elevated risk-profile of the project was due to these significant capital advances. As these were only advances, Cals had significant payment commitments remaining, amounting to Rs. 515.37 crore as balance payments towards these refinery equipments, at the end of FY'10. If Cals was unable to raise further equity or debt towards this requirement, the company faced the risk of losing almost all its capital advances and consultancy charges. At the end of FY'10, this risk amounted to some or all of Rs. 836.04 crore in capital advances plus consultancy. It is this risk-profile that stands substantially improved at the end of FY'11, thanks to a series of re-negotiations the company had with the refinery equipment owners, vendors, and consultancy providers. Though the Annual Report doesn't make it explicit, simple calculations revealed that deals against which capital advances amounting to Rs. 458.34 crore were made, are now being shown as risk-free. StockExplain took up this matter with Cals Refineries' management, and they confirmed this position. But we wanted to know the exact split-ups of these figures. In the past, that is even before the Cenco & Atas refineries came into the picture through Hardt, it was clear that Bayernoil Refinery of Ingolstadt, Germany, was not the only refinery that Cals was negotiating with, or had paid advances to. However, due to last fiscal's court case between Cals Refineries and Lohrmann International, who is the supplier of Bayernoil Ingolstadt, the company's communications as well as media coverage had largely focused on just the Bayernoil unit. Cenco & Atas refineries entering the picture, which also happened during this last fiscal, didn't help either in highlighting the older non-Bayernoil deals. By even a casual read of the Q1-FY'12 quarterly disclosures as well as the AR, it is evident that the Bayernoil deal through Lohrmann has run into problems. A new set of payment terms and schedule, that was probably inked with Lohrmann as part of the out-of-the-court settlement, now stands cancelled as Cals couldn't meet the new payment dates. Lohrmann is now legally free to sell the refinery to a new buyer, and in that case, Cals stands to lose advances paid for Bayernoil amounting to Rs. 335.59 crore. However, Cals is still trying to salvage the deal by arranging necessary funds through equity or debt, even while trying for time extensions with Lohrmann, which on its part is likely to find the process of identifying an alternate buyer, challenging. In any case, the advance paid for Bayernoil - Rs. 335.59 crore - remains as a full risk, as was the case with this payment in the previous fiscal, as shown in the Annual Report for FY'10. In this year’s AR, another set of advances, which is comparatively much smaller at just Rs. 31.14 crore has also been divulged as carrying significant risk of loss. StockExplain had queries on the reasons for this smaller risk, and Cals management has divulged that it is largely due to pending and/or still unsuccessful re-negotiations with a few equipment suppliers and auxiliary service providers. But the most interesting part remained, as both these updated risks amounted to a total of only Rs. 366.73 crore, or 44.45% of the total capital advances. The remaining figure of Rs. 458.34 crore in capital advances remained unmentioned in the AR and the current status of the deals for which this amount was advanced remained unexplained, despite the implicit assumption possible that they are now risk-free unlike in the previous year as shown in the FY’10 AR. It was not even clear which all were these deals. 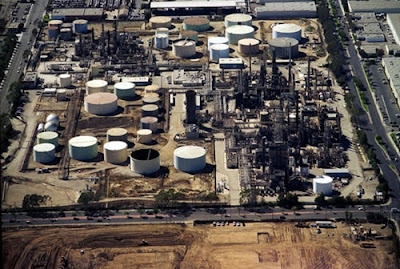 In the past the cases of several used refineries had cropped up in the media in connection with Cals. While some were just proposals or discussions, some media reports had mentioned agreements being signed and advances being paid by Cals. Some of these non-Bayernoil equipment were from Petro Canada’s Oakville Refinery, Petro Canada’s Edmonton Refinery, a refinery in Ark City, Kansas, and a Caltex refinery in Philippines. It didn’t help either to know that 60% of Oakville equipment had reached Pakistan’s Indus Refinery Ltd (IRL) by 2010. From the above it was clear that the old non-Bayernoil deals were as significant as the Bayernoil deal, both in terms of capacity – 5 MMTPA each – and in terms of capital advances. To give the actual numbers, Bayernoil advances were Rs. 335.59 crore against non-Bayernoil advances of Rs. 489.48 crore. Out of this Rs. 489.48 crore, Rs. 31.14 crore still carries substantial risk as mentioned above due to pending re-negotiations, but the remaining advances amounting to Rs. 458.34 crore are the advances implicitly being disclosed as risk-free due to successful re-negotiations. So, the question boiled down to which were these deals for refinery equipments that are relatively safer than Bayernoil, and still legally intact? On a further StockExplain query, Cals Refineries has now clarified that these advances were for certain equipment from three refineries – Ark City Refinery of Kansas, Petro Canada’s Oakville Refinery, and Caltex’s Philippines Refinery. These deals happened in 2008 and 2009. One objective of these acquisitions was to enhance the capacity to 10 MMTPA. Cals Refineries has also clarified that though they were in agreement with Petro Canada to buy some equipment from their Edmonton Refinery, this contract was not finally made effective. More importantly, no advance was also paid for Edmonton equipment. However, the successfully re-negotiated deals are not without further challenges. Cals has disclosed to StockExplain that the Ark City equipment is currently under evaluation on whether it can be successfully integrated into the revised project plan that now includes the Cenco & Atas refineries. The situation of the Oakville and Philippines refineries are even more complex. Though the contracts have been re-negotiated, and the advances are intact, it seems that Cals has essentially lost the chance for acquiring the specific equipments it ordered. Instead, the concerned vendors have re-assigned these advances to another party who will be supplying similar equipments to Cals. The company also informed that care is being taken to ensure that these equipments are compatible to refineries being bought from Hardt Group. Overall, the key takeaway from our discussions with Cals and subsequent analysis is that the risk-profile of Cals Refineries is now significantly better, better than it was during FY’10 end. Bayernoil advances were always a risk, and it continues to be so. It can even be argued that Bayernoil risk has increased during this year due to the new payment terms getting legally cancelled. But notwithstanding this, the overall risk has definitely reduced due to two factors. One, successful re-negotiation of old non-Bayernoil deals, and secondly, the entry of Hardt Group. The first factor cuts the capital advance risk by 55.55%, whereas during FY’10 the risk was 100%. Hardt’s entry is equally, if not more, promising as not only are they supplying two alternate refineries to Cals, but they are enthusiastic about becoming the largest and majority shareholder of Cals Refineries with a 64% stake, if and when CCEA approves the FDI. There is even a third factor that reduces risk. If Cals can successfully raise the necessary funds in time, and if Lohrmann agrees to honour the cancelled new payment terms, Cals stands to gain by way of reduced remaining capital commitment to the project, to the tune of Rs. 752.13 crore. Despite all the above points, it should be remembered that Cals Refineries’ auditors have called upon shareholders’ attention to the matter of risk in this way - "...the financial statements which indicates the existence of significant uncertainty about the Company's ability to continue as a going concern. The Company's ability to continue as a going concern is significantly dependent on its ability to successfully arrange the balance funding and achieve financial closure to fund its refinery project." Such auditor’s qualifications generally spell trouble for companies and their stocks, as was recently witnessed in the case of Kingfisher Airlines, despite UB Group’s deep pockets. But for Cals and the unique nature of its project, it is not a new thing, with previous AR also carrying the same warning. The obvious doubt is whether the old non-Bayernoil equipments can only enhance and complement the quantity and quality of products, or whether it can substitute Bayernoil’s role if needed. It seems that this is a complex technical issue that is still getting sorted out in the feasibility studies. Another doubt worth mentioning is that the detailed feasibility report by Saipem of Italy, is not mentioned in the AR. Instead, it has been mentioned that Chemtex which did the feasibility study for the first phase back in 2008, has now been re-entrusted with the task of creating a detailed feasibility report for the project for the benefit of prospective lenders. It is not clear whether this re-assignment was due to Saipem not submitting the report in time, or whether due to Saipem’s report being unsatisfactory to Cals, or some other reason like different roles for the two reports, like one for internal use and the other for lenders’ use. The main breakthrough that can deliver momentum for Cals Refineries remains the CCEA approval for FDI. If the CCEA rejects the proposal, it will be back to the drawing table for Cals. But if the CCEA approves it, many things will fall in place for the project. Mainly, it will enable Cals to again attempt the necessary equity expansion from investors like Kuwait’s Kharafi Group and financial closure (FC) for the project. Apart from the Hardt FDI for Rs. 1425 crore, which is an equity-against-capital-equipments deal, Cals Refineries need further cash equity infusion of Rs. 662 crore. The total equity planned for the project is Rs. 2900 crore, while the debt requirement is Rs. 5400 crore, thus making a total project cost of Rs. 8300 crore. Cals Refineries scrip has been recently relegated to the trade-for-trade category (T Group) from the B Group, by BSE to cool down the high price and volume volatility in recent months, which saw near doubling of the price and subsequent near halving. Cals Refineries trades much below its face value of Rs. 1, making it a so-called pennystock, and like all such stocks carries high investing/trading risk as just a buy or sell worth several lakhs is enough to impose an upper circuit or lower circuit in the counter. In preparation for the AGM on 27th September, the Register of Members and Share Transfer Books of Cals Refineries will be closed from tomorrow and until 27th, both days inclusive. Retail investors who are blindly bullish about the immediate prospects of Cals Refineries should also try to learn from the case of Indus Refineries Ltd (IRL) of Pakistan, which is a similar project involving re-location of used refineries. Despite buying Petro Canada’s Oakville refinery in 2005, and despite 60% of the equipment being shipped to Karachi between 2007-2010, and despite the project overcoming repeated fund crunches by attracting first European investors, then American investors, and then Chinese investors, the project has again come to a standstill as of 2011 due to another fund crunch. But India is no Pakistan. As the IRL Chief has repeatedly expressed, Pakistan’s volatile security situation due to terrorist attacks has been a major cause for IRL getting delayed. India already has successful refinery re-location projects to its credit in the public and private sector, the best recent example being Nagarjuna Oil Corporation Ltd (NOCL) which has successfully re-located a used refinery from Germany, which is now being re-erected in Cuddalore, Tamil Nadu. There is no reason why Cals too can't follow this path, with the support of Hardt and India's regulators. StockExplain which has been extensively covering Cals Refineries for some time now, has also some interesting internal data to report in this regard. Our close monitoring of the web search interest for Cals Refineries for our eight stories on the project reveals that both the quantity and quality of investor interest is booming. For example, StockExplain has been recently experiencing heightened interest and tracking of the developments in Cals Refineries by several big names in international investment banking, insurance funds, pension funds, mutual funds etc, including banks and financial institutions from USA, UK, Japan, Switzerland, Austria, Netherlands, China, and India. There is a fair probability that this recent high interest in the project is due to Cals and Hardt reaching out with their case before many institutions. Brilliant analysis..god bless you with more knowledge..
A great job indeed! No words to express my appreciation. Well done. "Apa ke analysis ko mera salam"
I think govt is taking the help from the IOC and others thats the reason they are taking so much time,govt will not reject the proposal because already FDI is slowing and due to this rupee is depreciating,1400 crores is a huge amount.